The Uno was the culmination of 4 years of Highschool Science Fair competitions. For my final year competing wanted to do something meaningful. I hoped I would represent Canada at Intel’s International Science and Engineering Fair. Al Gore’s Movie “An Inconvenient Truth” had recently come out and I wanted to do some form of green technology project. That same year, I was on a family vacation in China and was able to witness firsthand the effects of congested roadways and small 2-stroke gas powered scooters etc. I had always been passionate about motorcycles and decided to create an electric bike for my project. But, I didn’t want to simply make an e-bike I wanted to do something that would make a statement. Segways had just recently been released and as amazing as the technology was, I hated the design and look of them. I thought it’d be cool to somehow combine the inherent sexiness of a street bike with the green tech of a segwayas a way of capturing people’s imaginations about green tech. We’ve had the ability to make electric vehicles for a very long time. But, I have always hated how ugly and utilitarian any e-cars (prior to the Tesla) always looked. I have also always been fascinated by human machine interaction. I loved how seaways used the riders body movements to control acceleration. I wanted to take the concept a step further and control steering by using the riders body movements. Each of the independent wheels in the Uno have their individual suspension systems allowing the wheels to pull up into the body of the bike and banking the bike into a corner. As the rider leans into a turn, the same accelerometer that controlled the front to back acceleration would pick up on the sideways tilt and speed up the outer wheel accelerating into the turn. The Uno ended up being Awarded Invention of the Year by Popular Science Magazine in 2008 appearing on the cover of the May issue. This catapulted my science fair project into the limelight and it ended up appearing all over the place for a while having it’s 15 minutes of fame. From the publicity, I was able to found my business BPG Werks which went on to develop the DTV Shredder as well as release 2 more variations of the Uno concept. The Second Generation Uno was the next evolutionary stage of the Uno. It was incredibly difficult to control the Uno at highspeeds. Our goal was to create something that would eventually go proper road speeds and in order to do that, we needed a way of making the self balancing Uno more table at higher speeds. The solution was to make a transformer. The U2, was technically the worlds first truly transforming motorcycle. It would operate as a self balancing vehicle on a pair of parallel wheels at low speeds for more maneuverability. 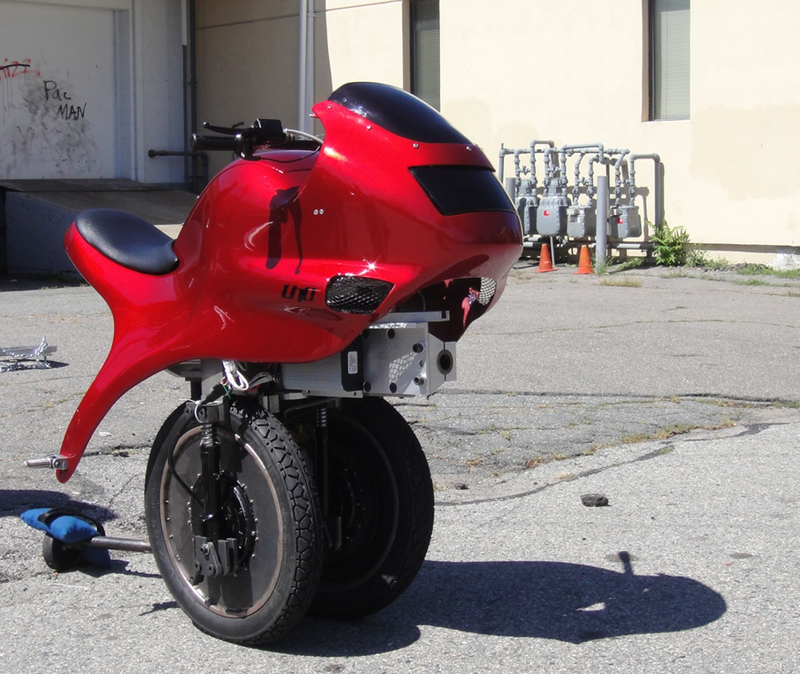 Then, at higher speeds, the wheels would splay apart transforming the “unicycle” into a conventional motorcycle. Although the vehicle is not the prettiest of vehicles, the concept of a transforming vehicle that changed it’s shape to react to the rider’s movements was ahead of it’s time I’ve always filed. Although the U2 worked and did transform a few times. The shifting wheels at speed proved to be quite dangerous. The way it worked was by essentially sliding 2 parallel wheel apart and twisting them slightly throughout the transition so that at the end of transition the parallel wheels are in line. Turns out this is really dangerous to do while moving. The 3rd Generation Uno was going to be a safer transformer. It had 3 wheels all inline with the central middle wheel tucked up inside the frame of the Uno. At low speeds, the handlebar controlled the actuation of the outer 2 wheels allowing the Uno to tilt from side to side just like the first version. As the rider leaned into a corner, the wheels would adjust their speeds to allow for banking turns. As the bike speeds up, the wheels splay apart. The outer 2 wheels slide back and pull in together while the middle wheel dropped forward. Throughout this transformation, the motorized actuation of the outer wheels disengaged to become a passive independent wheel suspension for the outer 2 rear wheels allowing for constant contact with the ground during turns while the front wheel engaged with the handlebar to become a traditional mechanically linked steering system. The system had some really cool mechanical and electrical engineering behind it.